Recently my wife was asking about storing important papers, valuables etc. in either a safe deposit box or a home safe. 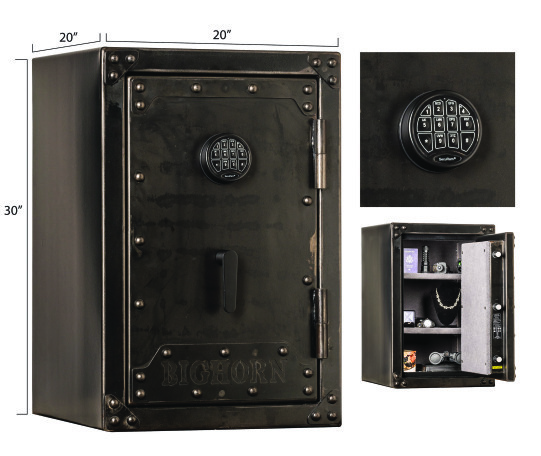 In light of present posts regarding some problems with safe deposit boxes, wanting to store a few large items and not having any experience with those or safes I thought some of you may be able to offer some insight on home safes. I figured a home safe might make our valuables more easily/quickly accessible in case something should happen to both of us. I checked with Costco and they have a 3.4 cu ft (interior) fireproof safe on sale for $400 that we would hold most anything we would want. I would prefer a dial (not sure why) but this has electronic pad. Can anyone offer some guidance/experience/suggestions/recommendations that would help with decision making? What brands and features are most desirable? I don’t know enough to recommend specific brands, but I would definitely recommend having a firesafe. I had a smaller one at the townhouse I lived in and sold last year which is where I also kept my important papers (Passport, birth certificates, ….). Had to leave it behind because it was bolted into the concrete slab and then I had added a small concrete and metal structure around it (i.e. required a jackhammer to remove) because I wanted it to be not only fire safe, but “99%” burglar proof also. I also had and still have a safety deposit box to keep some papers (or copies) and some stuff like gold, family jewelry…. I am currently living with my SO/fiancée and sort feel “naked” without a firesafe. I’m still trying to figure out where I can “secure” one in. I have a middle of the road safe bolted to my concrete slab. I think of it as both removing temptation from workmen and maybe preventing theft. In it, everything is replaceable. I have my passport, credit cards, some cash and papers, but my important stuff is in the bank safe. We keep a handful of documents in an unlocked firesafe in the basement. I don't want a 500 pound behemoth and I figured bad guys would be tempted to steal the one we have assuming there were valuables inside. But how many burglers want house titles, birth certificates, and passports? I am more worried about a fire destroying them. I have a Fort Knox safe, fire rated and very secure. Big enough to hold several rifles and and handguns along with all my papers and valuable. They are not cheap, but I am not worried about them being opened with a crowbar. I've seen a number of safes with electronic keypad locks and no physical key to override and open. Seems to me that in case of a serious fire, that plastic keypad would just melt and you'd be forced to drill it open at great expense. Having a backup key to open it would be a must, I think. There is a YouTube video showing how the most common Sentry brand household safe can be easily cut open in a few minutes using just an ordinary circular saw. But how many burglers want house titles, birth certificates, and passports? I am more worried about a fire destroying them. +1 The safe I was looking at may be too large but the price was only slightly more than a much smaller safe. I got a fire safe from Wal-Mart last year for less than $300. I think it was billed as a ten rifle safe, I don't see how that would be reasonable possible, but it's bigger than 4cf and has a classy brass-plated dial. Stack-on is the brand name. It's not super secure; you could get in it with a drill and diamond saw in under 30min, I'm sure. But that would require forethought and I figure competent thieves would get better return for their effort elsewhere. We have a safe that's 2/3 of the size of the smaller one in your picture. It's bolted to a shelf in an upstairs closet with bolts that cannot be easily removed, and requires both a key and a combination to open. About 95% of my jewelry is in there at any one time and I wear what's sitting out in the house. We also keep passports and birth certificates in it. As others have said, probably not totally burglar-proof but would discourage all but the most persistent. I wouldn't want an electronic keypad, either. We're about to put the house on the market and will let the buyers know about this at the closing (no need to point it out to every prospective buyer!) and will definitely get another in our next house. I believe jewelry is to be enjoyed and wouldn't want to mess with keeping it in a bank safe deposit box. Fire proof is a relative term. All documents will burn if the fire goes long enough. Get one with the a good fire rating.
. I would prefer a dial (not sure why) but this has electronic pad. We have several large gun vaults, and use them to store much the same as you are mentioning, including ~large~ valuable items that we don't want to have to travel back and forth to a bank to access. Depending on how large the items you are planning to secure (in addition to the smaller paper/jewelry type things) you may want to consider a gun safe. That way you'll have room for future expansion. But they take up room (think along the lines of a wardrobe). They are fire "resistant", so after a specified period of time the contents will be damaged in a direct fire. Insurance is a must if you plan to protect anything valuable. Like others have posted, a mechanical lock would be preferable to an electronic lock. Shop around, you might get a better deal from a safe or gun store as opposed to the Big Box outlet. And, they can be a major pain to move, so consider placement carefully. I would not go for a safe with electronic lock. Last month, I went to open my fire safe with electronic keypad to retrieve a document and the darn thing would not open. The keypad did not seem to function anymore and changing the batteries did not help. So I called the manufacturer (Sentry) and they were utterly useless. They advised hiring a locksmith to bust the safe open. I called a bunch of locksmiths but nobody wanted to touch a safe. Finally, I got a recommendation for a local "Safe Cracker". The safe cracker opened that thing in less than 5 minutes. He drilled a small hole through the top of the safe and into the top of the door. In went a long metal stem and, presto, the door was unlocked. I was in the next room when he was doing the drilling and didn't hear a thing. But having the safe cracked open ended up being more expensive than the safe itself. What this experience taught me is that most consumer-level safes are not all that burglar-proof. So, when shopping for a replacement, I am going to focus on fire protection and stick with a simple key lock. As an anecdote, my safe cracker said that when a fireproof safe is involved in a fire, it will seal itself shut, meaning you won't most likely be able to operate the door whether you have a plastic keypad or mechanical lock. He also said that, after a fire, people often rush to open their safe to check if the content is intact. Big mistake. You have to let the safe cool for several days. The content of the safe gets pretty hot and, unless you let it cool down, the inflow of oxygen when you open it will ignite the content. So your valuables will have survived the fire itself, and you end up destroying them. +1 - Also, I'd consider a rotary dial combination lock over an electronic one. We have only a bank safe deposit box which we've had for decades. I don't know what the problems are that you refer to. We don't worry about the jewelery and don't have large valuable times or big firearms. We just keep key documents in the bank box. Having a locked safe may precipitate a dangerous encounter. If the safe is "discoverable" by intruders, they may put a gun to your head and ask you to open it. My dad had a 1940's era safe that was very finicky to open. He usually had to try several times when he was not under any time restriction, and worried that he'd not be able to get it open soon enough if threatened. So he simply left it unlocked. If I had a locked safe, it would be in a very undiscoverable place, or else I'd leave the key in it. Safe Deposit Boxes - not so safe? is the problem being referred to. Thanks for all the replies and suggestions. I'll continue looking for a safe with a mechanical lock and a good fire rating. I may consider something a little smaller than in my original post due to the weight. Like most people I want to preserve important papers and maybe a few small items of limited value. I'm not too worried about a break-in by a safe cracker. My little old house is in a neighborhood of large new McMansions that are 3 and 4X the size of mine. Not worth the risk for the slim pickins.